The Math in Moscow program as my first real exposure to many concepts of higher level mathematics, including computability, differential forms, and homology groups, I found very informative and effective. in addition to the math instruction, I appreciated the support from the faculty in helping me to learn more about the fascinating Russian culture ! It has been a lovely experience. 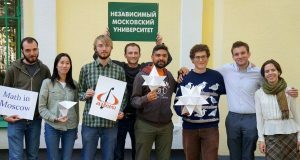 The MiM programme responds to the needs of all the people wishing to improve their mathematical background and have the intellectual curiosity to study in such a different and original country such as Russia. Unlike other students, I came with non-pure math background after a several years spent outside of Academic education. Although I had challenging time at the beginning, I was able to overcome the difficulties and get a support to catch up with the required knowledge. I advise students to come with a strong background in real analysis and linear algebra, that enables to enjoy a high variety of courses. But regardless of your level, you will be sufficiently stimulated. We live in a world where the demand of people with mathematical skills is increasing, and MiM can certainly respond to this high demand. Beside, people that are curious in Russian culture will have plenty of courses to further cultivate their interest thanks to the enriching insights from the environment. The MiM program has a very nice selection of classes for its very small size, and the opportunities only grow as teachers are happy to teach courses outside of those advertised. The professors teach clearly and clearly are very experienced in everything they teach. If you are looking for a nice challenge, you will find it here no matter your level od experience. As a Russian minor, a math major, I expected this program to be great for me – and it was, more than I could have hoped. The intimate class settings taught me mathematics in my favourite way. and it was a great opportunity to see the real Russia with its real people, in contrast with nightmarish mythologized form it takes in the eye of the ill-informed American imagination. Moscow is a lovely place and its mathematicians no less lovely. I highly recommend this program to anybody interested in pure mathematics and Russia. The program is very flexible, and can be personalized to fit any student’s needs. Moscow is a special place. Math in Moscow is a great option to study mathematics and learn much about Russia. The small classes make it possible to have individual discussions with the professor. And taking some HSE classes can make one find out about his mathematical interest and strengthen the decision whether to take a master and/or PHD program. The cultural program in the beginning gives an insight view in Russia and encourages one to do more trips and find one out by his own. I would like to encourage everyone interested in mathematics and Russia to apply. especially non-US students as they are still underrepresented.